This newsletter is dedicated to a new edition of the Venus Horn and a special sale on related Abundance jewelry. Enjoy! Based on the famous HORN OF PLENTY, a symbol of good fortune, Love and abundance. The time elected for the creation of this talisman has Venus rising in the east In her sign of Taurus, on her planetary day and hour, while harmoniously aspected (sextile) by the Moon in Pisces from the very beneficial 11th house. Venus is also harmoniously aspecting (trine) the powerful exalted Mars in Capricorn, ruler of the 7 house of partnership - rendering this talisman as even more powerful in love, sexuality, and attraction. Venus and the Moon are in mutual reception! By exaltation (Moon exalted in Taurus and Venus in Pisces). This is a Talisman for all the Venusian gifts in Taurus, the gift of plenty and abundance, the gift of sensuality and attraction, the gifts of beauty and pleasure, artistic ability and a general feeling of well being. 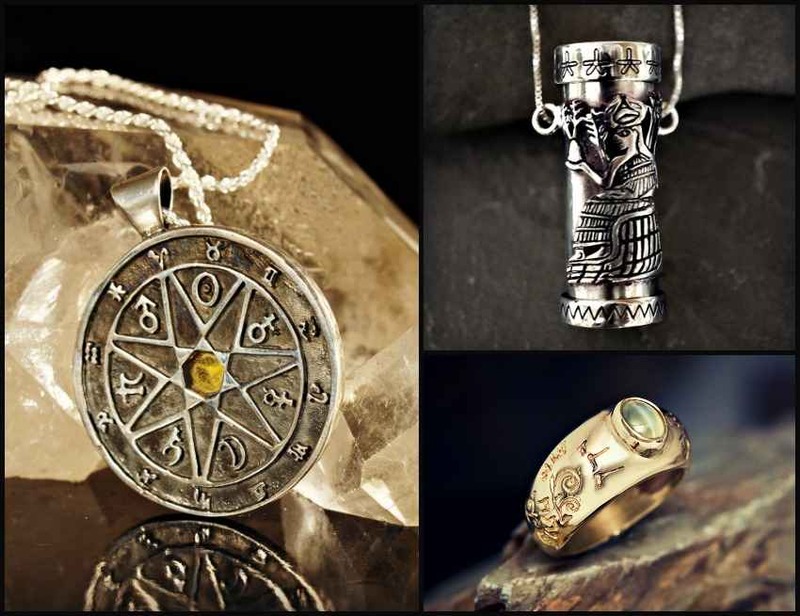 The design of the Talisman comes from the famous 16th century Magus John Dee, who was a Philosopher, Astrologer, Alchemist and an adviser to Queen Elizabeth I. In a Magical text entitled “The Little Book of Black Venus” Dee gives this complicated design for a Venus Talisman, with many sigils of her spiritual hierarchy. 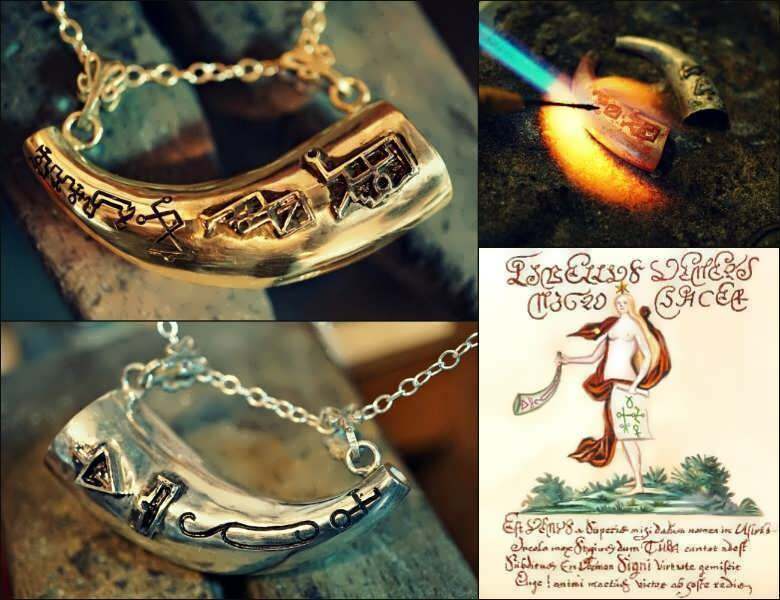 He then provides a very long and elaborate ritualistic protocol for the creation of this Talisman, while also using a real bull’s horn. In this design, I am creating a silver or gold horn-shaped Talisman and following the ancient traditional methods and consecrate this Talisman under the Venusian election stated above. Behind every piece of this collection lies a deep intention and meaning that reminds you, the wearer, of your ability to create abundance in your life. The first stage to achieving abundance is the change of attitude, from one of lacking to one of plenty. 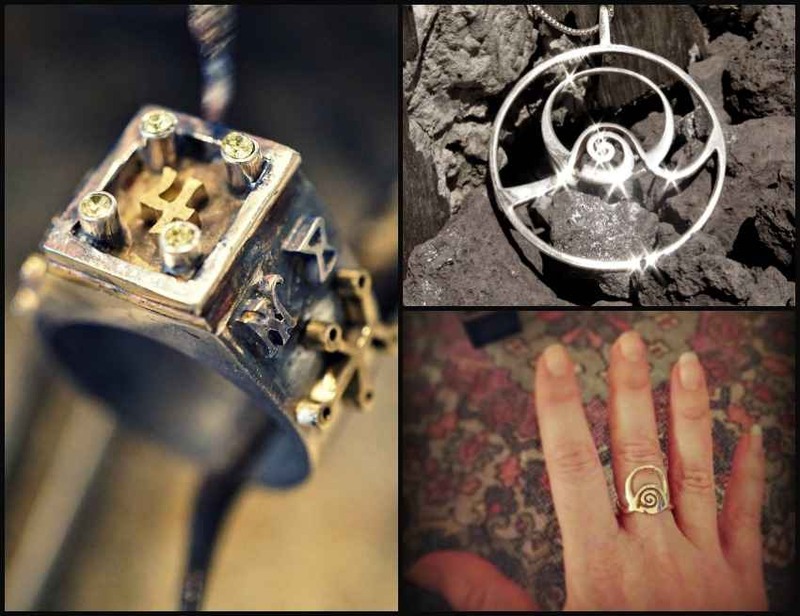 Wearing a permanent reminder combined with the symbolism behind the jewelry works on our consciousness. For example, the Ring of Abundance combines the Cat's Eye stone, a stone known for its power to bring abundance, with the inscription "Opens thy hand and satisfies all that is alive". This combination of the two makes the ring to an effective tool for the creation of abundance in your life.